On a chilly morning or a cloudy afternoon, there is nothing more pleasing than tea and toast. In the absence of electric kettles and toasters, this pair does the job very nicely. Growing up, I remember having a copper kettle in the kitchen for much of my early childhood in the US. 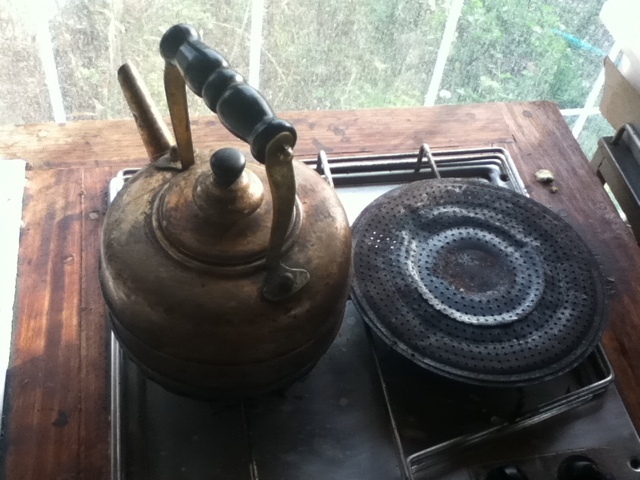 When we moved overseas, electric kettles supplanted it, but I remembered the cheerful whistle of our old kettle, and was delighted to receive this kettle as a birthday present from my mother. On the right, your eyes do not deceive you if what you see is a simple heat diffuser for the stove. It doubles very nicely as a toaster, though. I love toast, so I was excited to learn, from Adi Pieper’s book, “the Easy Guide to Solar Electric (part 1)”, that in spite of not being able to plug in a toaster, I’d still be able to have my toasty slices. I can feel my eyes glaze over and my mind becoming impermeable when I read about electricity, so I can’t claim to fully understand our solar power system, but I do well with rules of thumb (heating and cooling are largely out of reach) and useful tactics. In addition, I am experiencing a slight strawberry jam obsession. We ran out of last year’s jams (peach and quince) a few weeks ago, right as strawberries started showing up at the vegetable markets. I made a batch of freezer jam that turned out pretty well, but I had a recipe that I’d been curious to try. A while back, before my mom moved to NY, a friend came to visit from Paris and brought us an extraordinary bottle of jam. It was seedless raspberry jam, if you can believe it, and it had been made by a woman named Christine Ferber. I soon learned that she is a famous jam maker, and that her cookbook, “Mes Confitures”, was available on English. Naturally, I got a copy, and strawberry jam would be my first foray into her methods. It was, to me, an unusual recipe that required not only that the berries be macerated overnight in sugar, but also that, once brought to a simmer the following day, they be macerated again overnight. Then the syrup was to be strained and cooked further, and the strawberries added for a final cooking. It was then, she promised, that the berries would “become translucent”. Surely not, I thought. But as I peered into the pot of boiling syrup, with strawberries bobbing to the surface, I caught a glimpse of a translucent berry. I fished one out with a spoon and admired it. The berries had been transformed into glistening jewels. And the jam is just wonderful on toast.